Yay! I just got an extra copy of Blueprint Crochet Sweaters: Techniques for Custom Constructions. You know what that means…time for another book giveaway! This book is full with modern, beautiful sweater patterns, it’s hard to choose which one to start first. The sweaters are also constructed using different methods, so there is a lot to learn about sweater construction! If you’re interested in crocheting different types of sweaters, this book is definitely for you. Go to the Blueprint Crochet Sweater Amazon.com page and click on the “Look Inside This Book” link to look inside the book. Then in the comments section on the bottom of this post, share with us which project/type of sweater you’re most excited about starting! Remember to only comment one time (since there is only one entry per person). Duplicate comments or comments that are not on topic will be deleted. Giveaway ends on Wednesday, May 7, 2014 at 11:59PM EST, where a winner will be randomly selected. Be sure to check back to see if you win! Have fun looking through the book and good luck everyone!! This giveaway is now closed. 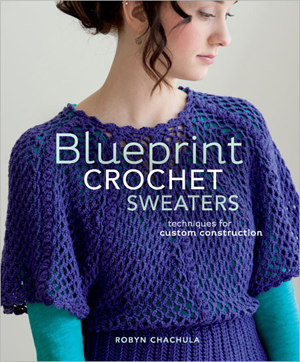 The winner is announced on the Book Giveaway Winner: Blueprint Crochet Sweaters page. This entry was posted on Thursday, May 1st, 2014 at 12:00 AM by Rachel Choi	and is filed under Fun Ramblings, News. You can follow any responses to this entry through the RSS 2.0 feed. Both comments and pings are currently closed. It’s a hard decision, but I think the Calypso Kimono would be the first thing I made. Hello all.. This book is beautiful. My fav was the Burnt Plaid Dress as I love sweeter dresses and I’ve always wanted to try a plaid pattern. I will also try the top down if I win and many more as I have four daughters, three granddaughters and me and my Mom. Happy crocheting everyday. The second on the copyright page with the wonderful open pattern looks amazing! Thanks for the chance to win!!! That Clover Car Coat sounds fun. I just love the rose-colored flower-ish pattern on the copyright page–beautiful! Thanks for the chance to win! I absolutely love all the sweaters, but, we have to pick one. I’m going to say the Classics are mostly what I make.After all my work making them I want them to be current for a long time. I love the Veronica Pullover for starters but there are others I would love to make as well. Wow. crochet sweaters can be quite beautiful. I like the sweater on the cover and the rose colored motif sweaters! those would be fun to wear. I would like to try the open pattern that has the solid collar. I’d like to try the Clover Car Coat. I’ve always wanted to have a crocheted coat for the transitional seasons. I would like to make the Walnut Berry V Neck Cardigan. The description says it is lacy pattern. This sounds perfect for a summertime sweater to wear when the air conditioning is a little too cool. Thank you. I like the green short sweater that you can only see the front with all the neat cabling on it and hook & eye closers. The cable would be my choice, a solid pattern perfect for winter and something I haven’t tried. I would like to try the structured cardigan. They all sound fun, but I think I would try the Burnt Plaid Dress first. If I won I’d make the one on the cover first for my Grandaughter. I love the raspberry one. I have never crocheted a sweater, it would be a great challenge! The names of the pictured sweaters were not given, but the crop-sleeved cranberry colored one looks adorable. But then, the blue one with the ribbon tie is a cutie also. Hard to decide. That’s why I need the book so I can do both of them. I crochet a sweater every winter, so I’d really like to take a look at this book. I would be most excited to make any sweater from the top-down and in-the-round section first because I like to try them on as I make them. Thank you for giving us a chance to win this book. Hello, I think I would like to crochet the green cabled sweater first. I’ve been trying to learn the cables and other surface crochet techniques. I just love the oriental-looking front with the frog closures as seen on page 10. Thank you for this great give-away! I’d like to try the Rose Quartz Pullover. I’d like to crochet a sweater that’s top-down. My favorite is the Walnut Berry V-Neck – would love to give this a try. There are a couple of others I liked also, but this one is my favorite!! Thanks for doing this give-away!!! I think the cranberry cardigan is lovely and looks interesting. I would like to try my hand at the Unique Construction patterns. I have such a problem crocheting cloths that actually turn out the size they are supposed to be. These sweaters look like they would be challenging to crochet. I would make them all. I’d try the Foliage Shrug. I haven’t made sweaters before, so maybe I will start with the Cranberry Cardigan. Thanks for the opportunity, i would try the Calypso Kimono, then the vest. always a sucker for sweater dresses, so the burnt plaid dress it is! I really like the Magnolia Tank. Thank you! I love the second on the copyright page. The back looks incredible! Hrm…decisions, decisions. I love the sweater on the cover! I think I might do that one for my youngest daughter. I don’t remember if I entered already, and I couldn’t find an entry. So, this is my entry. The mention of customization caught my eye. I would like to learn how to customize patterns to fit the intended wearer.